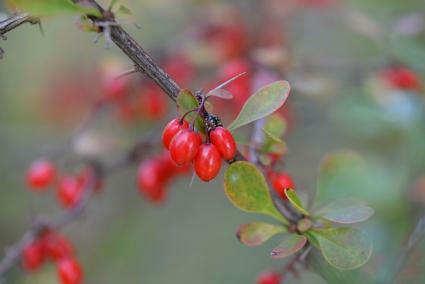 Barberries (Berberis spp.) are a large group of shrubs found growing wild throughout the temperate climates of the world. Several are used as landscaping plants and are known for their colorful fruits and foliage and minimal maintenance requirements. Barberry bushes have narrow, oval leaves that are usually about 1/2 to one inch long in colors ranging from green to bluish to dark purple. The 1/2-inch berries are bright red and persist well into winter providing decoration for the garden and food for wildlife. Compared to the berries and foliage, the yellow flowers in spring are not very showy, but are a brief treat before they fade. Barberries are also known for their sharp thorns, which can be a drawback in some situations, though it can also be an asset if they are used as an intentional barrier along the property line. Their height varies from two to eight feet. Barberries prefer sun or partial shade. They are tolerant of most soil types and can withstand dry conditions. However, they should be irrigated regularly in the first two years after planting to ensure good root establishment. Barberries are essentially hedge plants, whether as a border, barrier, foundation planting or in a woodland garden. Barberries are commonly found in nurseries throughout the country and should be planted in spring or fall as transplants. 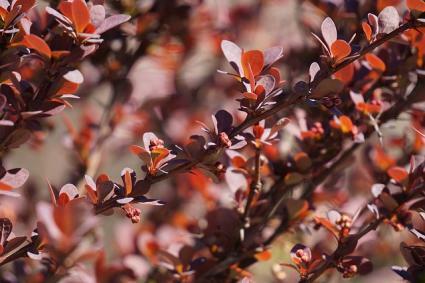 Modern barberry cultivars tend to maintain an attractive rounded shape with little to no pruning, but they can be cut back severely in fall to control their size if necessary. They are also quite attractive when sheared into a formal hedge. Pests and disease are generally not a problem with barberry, though sucking insects like scale and aphids occasionally appear, as do fungal diseases like powdery mildew. Barberry fruit is edible and has a long history of medicinal use. The berries have a sharp acidic flavor when raw, so they are typically processed in jams and jellies. For medicine, the root bark is the primary portion of the plant that is used; it contains a compound known as berberine that has been used as a cancer-fighting drug, to treat dysentery and for various other ailments. Plants grown for ornamental purposes are not typically harvested for medicine since disturbing the roots has an adverse effect on the growth of the plant. Barberries are hardy in USDA zones 3 to 9. 'Crimson Pygmy' is a dwarf variety that grows just two feet tall and three feet wide and is known for its deep purple-red color. 'Rose Glow' grows six feet tall and wide and has leaves that emerge pink and then become purple-red over the course of the growing season. 'Aurea' has chartreuse leaves and grows about five feet tall and wide. In the New England area, the Berberis thunbergii (Japanese barberry) species is considered invasive. Plant with caution; it's even been banned in some areas. Barberries are very throny so they are best enjoyed from a distance. 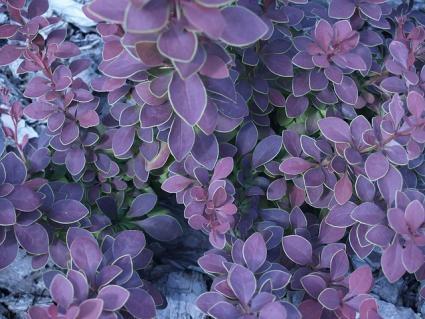 They are one of the most versatile foliage plants -- try combining the different colored forms for a striking contrast.